By Meredith Chilson on June 5, 2012 Visit Meredith's Website. “down-home” remedies—rejoices at new life with his families and sheds a tear at life’s end. However, our vet specializes in dogs, cats and horses. Not chickens. He has treated poultry on his travels throughout the county, of course, and he had avian courses in his studies at Cornell. But, chickens are not his specialty, so I’ve often made the primary flock health assessments myself. True emergencies. These seem to involve blood, puncture wounds or choking, and they need to be addressed immediately. Chronic problems. Frozen combs in the winter, crooked beaks, for example. Often the emergency situations eventually end up in this category, too. Vague symptoms. These are the chickens that just don’t “act right.” Often by taking some time to assess the symptoms, a diagnosis can be made (sour crop, egg binding) and treatment can begin. Most of the time medical care for your chickens can (or must) be handled right on the spot, at home. In case of emergencies, it’s important to have an area in which to separate the ailing bird and a well-stocked first-aid kit. 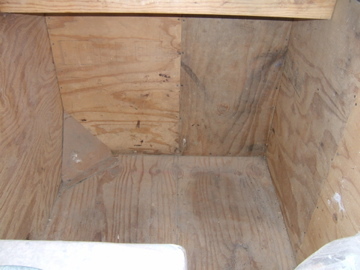 The area to confine your bird can be a separate section of your coop, a large box or even a wire dog crate. The idea is to have a spot where the chicken can heal without distraction or picking by the rest of the flock. A separate part of our coop can be fenced off quickly. Our dog crate has come in handy, particularly in very cold weather or when the coop section was already in use. 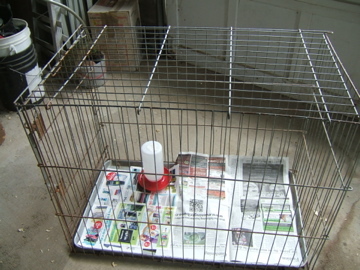 This also works very well for birds that I want to keep closely confined. I have used our wire summerhouse as an enclosure, too, especially when getting ready to reintroduce a healed bird back in with the others. Whatever spot you choose to use for a “hospital room” should be free from drafts, easily accessible and separate from the other birds. 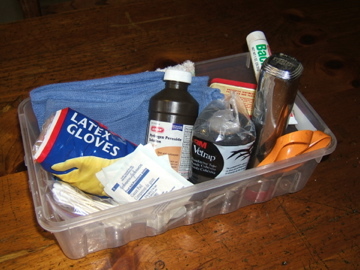 The first-aid kit is something that I keep right in the coop in warm weather, and on a shelf in my entryway in the winter. When there’s a Chicken Emergency, it’s not the time to remember the gauze pads are gone, the last of the peroxide was spilled and never replaced, or to have to dump out your makeup bag looking for the tweezers. You need to be able to grab your kit and go to work. ·Cotton towels and an old washcloth. These can be used as a lap cloth or a table cover. Sometimes, just wiping an area with a warm, wet washcloth makes the emergency seem smaller. They can also be used as compresses, or for removing “buildup” on the back end of a baby chick. ·Hydrogen peroxide. I’ve used this to clean scrapes, small skin tears caused by catches on wire or rough vegetation and spots where feathers have been pulled out—places where skin needs to be clean and disinfected. ·Latex gloves. Always a good idea when treating injuries. ·A flashlight. For close examinations. ·Sterile gauze pads. Great for compresses and wound coverings. ·Cotton swabs and cotton balls. For dabbing on ointments and swabbing areas. ·“Vetwrap.” A horse owner told me about this—and I found it in the horse supply section of my feed/animal supply store. It’s bandaging tape that sticks to itself, not feathers or skin. ·Bacitracin. I use this as an antibacterial ointment. It has no sulphur in it, which I’ve read is not something to use with chickens. I’ve used this successfully on wattles and combs that have been frozen in really cold weather and under the vet wrap and gauze pads wrapping a wound caused by other chickens’ picking. ·“UdderBalm.” Petroleum jelly works, too, but I think the oil of clove and other ingredients in this product make it superior to the jelly. This is my first line of defense when I notice a weeping or bleeding spot on a chicken. The antiseptic properties of the balm help heal without scarring, and the thick, waxy texture keeps chickens from picking at it more than once. ·Tweezers. For removing splinters, pieces of grass that are too long for swallowing, and other operations that require a small, precise tool. ·Eyedropper or syringe. For dispensing liquids—olive oil to ease a sour crop, for example, or for irrigation of a wound with warm water. 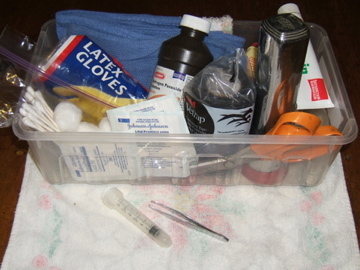 As you probably have surmised by reading the list of first-aid kit contents, most of the medical emergencies I’ve encountered involve scrapes, scratches and bleeding. These are the life and death problems or the simple ones I feel confident handling. For the problems I cannot solve with a warm compress, TLC or simple measures, I check with the vet, the Internet and my dad. (Not necessarily in that order.) First aid, to me, means FIRST. What’s in your chicken medicine cabinet? We also keep the self-sticking bandage on hand, but purchased at the drug store for people. We have used it twice for goslings that were growing ‘angel wings’. I keep Blu Kote for injuries and also to mark the feet of roos that will go in the freezer. The homeopathy remedy Nux Vomica for the birds that ‘just don’t seem right’. Poultry Protector enzymes in a spray bottle. One time we had a problem with mites and this took care of it. Spray the walls of the coop down and also spray the birds carefully avoiding the eyes. I keep a small travel sized bar of Dove soap, and a bottle of water (the hose is never close enough when I need it). This cleaning is adequate for almost all wounds. I also keep benzalkonium chloride pads on hand for cleaning, too. It can be less harsh than hydrogen peroxide. Also, an alcohol gel hand cleaner and alcohol pads for cleaning my tools. I am ‘of a certain age’, so I keep a pair of reading glasses in the box for close up work. I also keep Thera-tears, a substitute tear product for flushing the eyes since tap water can sting. (I’m an RN, so I transfer my knowledge to my critters…) Thanks for your wisdom! 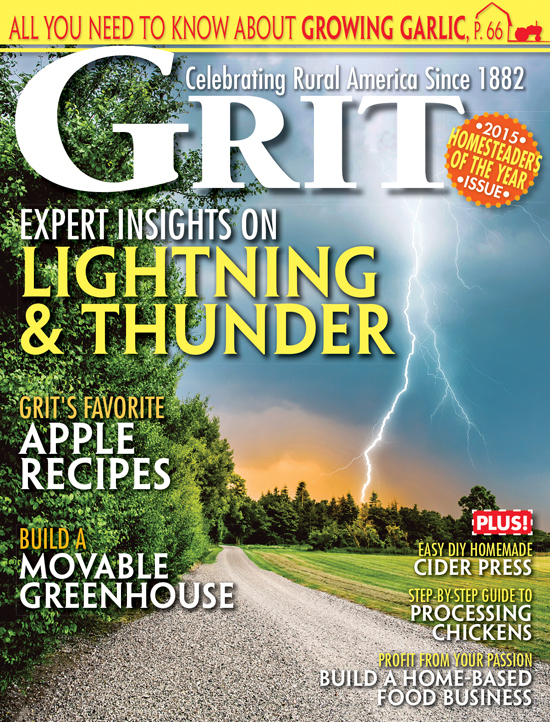 This was an excellent article, thanks for your information, I plan to share with others! What is sour crop and what is egg binding, I have not heard of them. A dog-owner friend told me to always keep in my first aid kit-magnifying glasses or reading glasses. Thank you for this post. Although we have already been using many of these items to treat our chickens, including the dog cage for isolation, I have not taken the time to create a “kit” where these supplies can be gathered together in one place. Time to do that now, I think! Thanks again. Could someone respond with a good reference link for some of the commonly ‘home-treated’ conditions someone with a flock in north TX might encounter. I’m just starting my flock and my vet specializes in large animals. Thanks! We don’t have our chickens yet, but thank you for the list of what you keep in your medical kit. I will get that the same time I get the chicks, that way I’ll be prepared from the start!